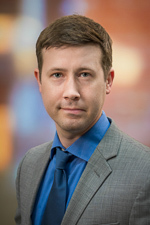 Dr. Coleman is an assistant professor of pathology at the University of Utah School of Medicine. He earned his MD at Case Western Reserve University School of Medicine in Cleveland, OH, in 2007. Dr. Coleman subsequently completed his residency in anatomic and clinical pathology at the Cleveland Clinic (2011), followed by fellowships in hematopathology at the University of New Mexico (2012) and molecular genetic pathology at ARUP Laboratories/University of Utah (2013). He is board certified in molecular genetic pathology, hematopathology, and anatomic and clinical pathology, practicing most recently at the Ohio State University (2013–16). Immediately prior to joining the University of Utah, Dr. Coleman served as the vice president of medical affairs with GenomOnocology, LLC, in Cleveland, Ohio. His academic interests include leveraging machine learning techniques to facilitate interpretation of genomic data.